Melanie Stark knew exactly what she was getting into when she was hired to work in the music department at Harrods. The famed British department store has a notoriously staunch dress code, and is very specific about wearing makeup. Still, when she was fired for not following it, she claimed that she was "driven out," and filed a complaint. And now the press seems to be more fired up about the whole thing than she is. All British shoppers know that they're so strict at Harrods that there's even a dress code for customers, listed under "Visitor Guidelines." It states: "We would kindly ask all visitors to ensure all clothing is clean and presentable and that the appropriate footwear is worn whilst in the store. We would also ask that visitors refrain from wearing clothing which may reveal intimate parts of the body, or which portrays offensive pictures or writing, as well as refraining from wearing crash helmets in the store. In particular the code does not permit any person entering the store who is wearing high cut, sports or beach shorts, swimwear, bare midriffs, athletic singlets, cycling shorts or general sporting attire, bare feet or any extremes of personal presentation." So it should come as no surprise to anyone that the guidelines for employees are even more detailed. 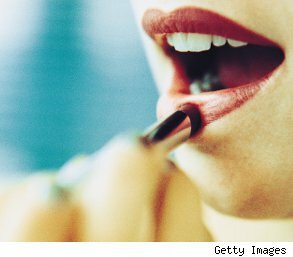 According to Salon.com, there are two full pages of them for women, and they say that women must wear: "Full makeup at all time: base, blusher, full eyes (not too heavy), lipstick, lip liner and gloss are worn at all time and maintained discreetly (please take into account the store display lighting which has a 'washing out' effect)." Stark didn't wear makeup to her interview five years ago, and she got the job anyway. While she worked there, from time to time she would come to work makeup free, and no one said anything until last August, when senior manager noticed her clean face and sent her home. She was then demoted to the stockroom. They offered her a makeup workshop, and Stark said that she was "appalled and called the offer "insulting." She said, "Basically, it was implying that it would be an improvement," according to the Daily Mail. She went back and forth for a while with Harrods management, and finally it was decided that it would be best if she moved on. Although Stark has filed a complaint, she doesn't seem to be making half as much of the issue as the British media. Sali Hughes of the Guardian says that the firing is "deeply sexist," going on to write, "It implies that a woman, however clean and presentable, can pass muster only in heavy makeup, and that anyone opting out is by default shabby and below par." On the other hand, Liz Jones of the Daily Mail says that employers whose employees work with the public have a right to hold them to certain standards. "Women who feel no compunction to improve what nature bestowed upon them are, in my experience, arrogant, lazy or deluded, and frequently all three," she writes. "Why does a young woman think her desire to show us her open pores and ruddy complexion outweighs the wishes of her employer to present a polished face to the customer?" Jones sums up, "Conforming to a high standard of dress code -- and, yes, making the best of your looks in the workplace -- is a sign of strength, not weakness. Kate Middleton, Michelle Obama and even Hilary Clinton do so every waking moment of their lives. You'd think a shop assistant could bring herself to do the same."